ALERT: Please be advised the property located at ES Pinecrest Drive has been removed from the Auction list. 321 TIFFANY STREET has been exposed to the elements for a significant amount of time and has what appears to be vermiculite insulation exposed in some areas. Please be advised, Vermiculite insulation may contain asbestos. CAUTION SHOULD BE EXERCISED BY ALL PARTIES WHO INTEND TO ENTER THIS STRUCTURE. 168 CENTRE STREET appears to have black mold present throughout the dwelling. CAUTION SHOULD BE EXERCISED BY ALL PARTIES WHO INTEND TO ENTER THIS STRUCTURE. I. Office of Housing, beginning Tuesday, April 16, 2019 - Tuesday , May 7, 2019. The Offie of Housing is open Monday-Friday from 8:30am-4:30pm and located at 1600 E Columbus Avenue, Springfield, MA 01103. II. Property Open Houses held on Saturday, May 4, 2019 on site at the following locations and times. I. Office of Housing, beginning Friday, September 27, 2018 – Tuesday, October 23, 2018. The Office of Housing is open Monday – Friday from 8:30am-4:30pm and located at 1600 East Columbus Avenue, Springfield, MA 01103. II. Property Open Houses held on Saturday, October 20, 2018 on site at the following locations and times. ALERT: Please be advised, 68 Abbott Street has been removed from the auction. ALERT - Please be advised, 74 Irvington Street has been removed from the auction. ALERT - Please be advised, the pre-auction inspection scheduled for 21 Greenwich Street has been canceled. ALERT: Please be advised the property located at 46 Wellesley Street has been removed from the Auction list. ALERT: Please be advised the property located at NS Orange Street (09340-0015) has been removed from the auction list. 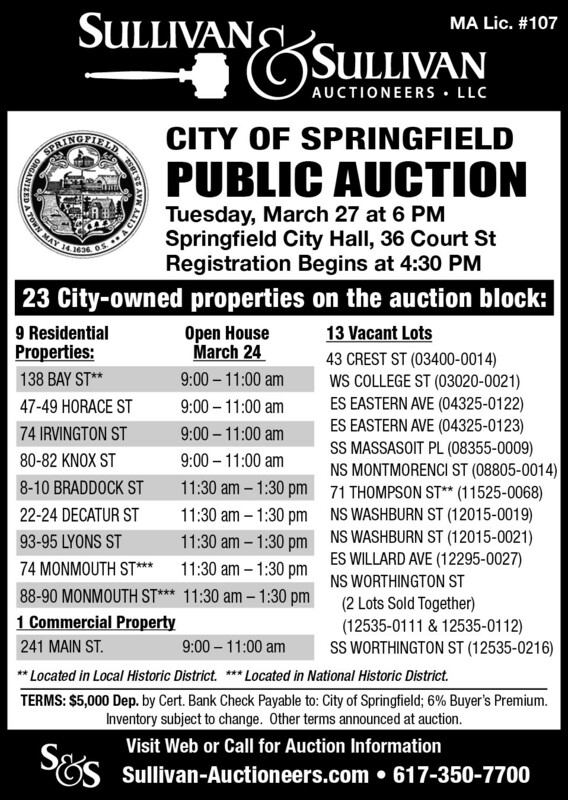 ALERT: Please be advised 15 Massachusetts Avenue has been removed from the auction list.